This handsome little book has a leatherette cover and makes a fine gift for a friend or yourself. 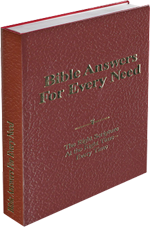 Scripture is organized by topics covering literally hundreds of subjects: salvation, justification, heaven, hell, giving, Jesus, the Holy Spirit, anxiety, prophecy, anger, forgiveness, assurance of salvation, wisdom, angels, pride, Satan, God's Love, God's wrath, greed, coveting, marriage, riches, miracles, finding God's favor and on and on the list goes! Great for handing out to friends! Nice compact book. Great for when you want more than a tract. 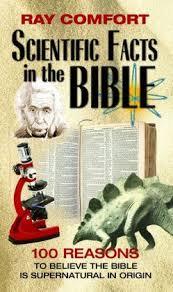 13 interesting and informative chapters clearly explaining scores of bible verses showing the hand of God in writing the Bible and laying out scientific principles thousands of years before they were discovered. Topics covered: Medical Science and the Bible, Biology and the Bible, Archeology and the Bible, Astronomy and the Bible, Genesis and Science, Dinosaurs, Historical figures and their view of the Bible, Bible Prophecy, Evolution, the book of Job, the plan of salvation and much more! These compact and easy to read books make for fun reading and a nice witnessing tool. Give to friends, co-workers, relatives or even complete strangers!